News Flash: Early this evening a local pug known as Pugsy Malone was brought in for questioning and subsequently booked on suspicion of stealing a large sirloin steak from a local backyard cookout. Pugsy had no alibi for the crime and was unable to explain facial stains positively identified as steak juice by the CSI forensics team. 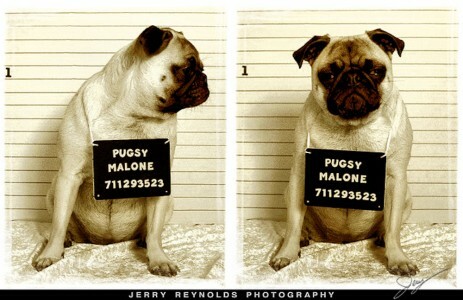 Pugsy has a long rap sheet of similar offenses according to his owner. The missing steak was not recovered. Credit: Special thanks to Jerry Reynolds for making the photograph used for this jigsaw puzzle available through the Creative Commons Attribution ShareALike license. Visit Jerry Reynolds's Flickr photostream. See all jigsaw puzzles based on Jerry Reynolds's photographs.